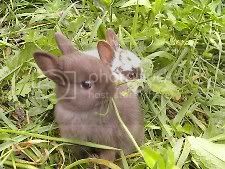 You may know already that baby bunnies between the ages of four and seven weeks are vulnerable to enteritis and are more likely to die than a three-week old from intestinal problems. But do you know exactly why? If not, read on. We’re going to talk about what goes on in that baby bunny belly. Newborn rabbits are quite unique in that they have no living microorganisms in their stomach or intestines. They start off life with a pH of 5-6 and are protected by the special milk oil in rabbit milk. Rabbit milk oil has an anti-microbial property. No other animal’s milk has this property. This is one reason why I’ve never bothered to feed babies a substitute milk (since my first litters when I was panicking because I never saw her feed the babies). Nothing can substitute for rabbit milk. (That’s not to say that orphans cannot be fed and live, it’s just to say that the return on investment of time is poor.) 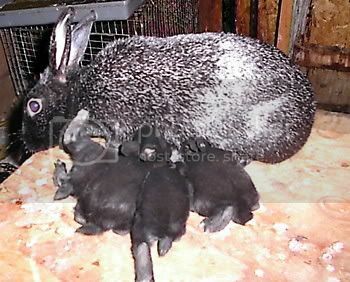 If you are worried your female rabbit is not feeding her babies, please see this article on the topic. For the first three weeks, nothing changes except the quantity of milk the babies ingest. At three weeks, the doe is producing the maximum amount of milk she will produce. After that, the supply begins to decline as the babies start to nibble on solid food. At this point, the pH starts to decline in the stomach. Now we start to enter the vulnerable zone. The pH has not gotten down to the protective 1-2 that it will eventually have. That level has its own anti-microbial properties. The milk oil, with its protective properties, is declining. As the milk oil declines, the normal flora starts to colonize, if everything goes well. But basically, the bunnies are working without a net during the period between full milk oil protection and full 1-2 pH/colonized flora protection. Stress, lack of inoculation of microorganisms (normally from consuming cecotrophes from a healthy dam), and an inappropriate diet –too high in energy– can tip the balance in favor of infective organisms instead. Between six and seven weeks, the bunnies typically will be fully weaned (though we’ve known some dams to continue to nurse occasionally for far longer). Between seven and eight weeks, the pH should have leveled out around 1 to 2 and feed consumption begins to level out as well. It is tempting to breathe a sigh of relief when bunnies make it to eight weeks. They have accomplished something important, after all. Of course, stress, diet, and other illnesses can still bring on enteritis in the future, but at least that baby bunny made it through the first danger zone of bunny life.